Produced in New York City from 100 percent locally sourced surplus cotton—and lined with lightweight organic cotton—the Ltd. LBD was designed to be universally flattering, with expanding pleats that allow extra give or take at the bust and hips. 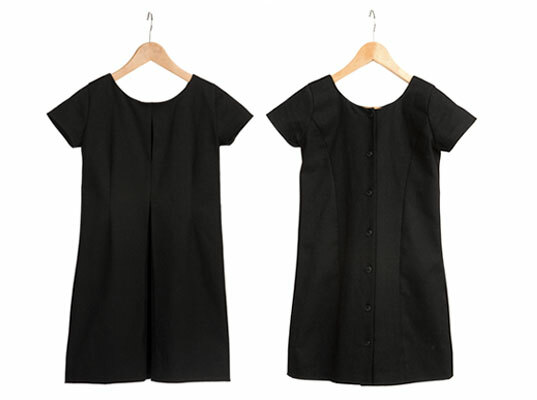 Although a near-identical copy of Matheiken’s own LBD, the Ltd. has been adjusted for a variety of sizes, with added length for the larger sizes and a higher hem for the teen version. When you purchase a dress, you’ll get to “own” your favorite day on The Uniform Project’s website. Because each limited-edition frock represents one day in Matheiken’s Uniform Project challenge, when you purchase a dress, you’ll get to pick your favorite day on the calendar when you place your order. As the day’s “owner,” your name and comment will be permanently added to the corresponding entry on the site. Plus, $30 from each purchase will go to the Akansha Foundation, which pays for the educational expenses (including uniforms) for children living in India’s slums. “Let this LBD be your personal styling canvas,” Matheiken says. Orders made before April 1 will be shipped in May, just in time for Matheiken to put the finishing touches on her yearlong endeavor. Want to make like Sheena Matheiken and start your own mini Uniform Project? The now-iconic Little Black Dress by designer Eliza Starbuck is now up for grabs. You'll want to act quickly, however, because only 365 LBDs will be made to order�one for every day of Matheiken's yearlong "wearathon."